These two letters from the Allen T. Ward collection focus on Kansas at the onset of the Civil War. 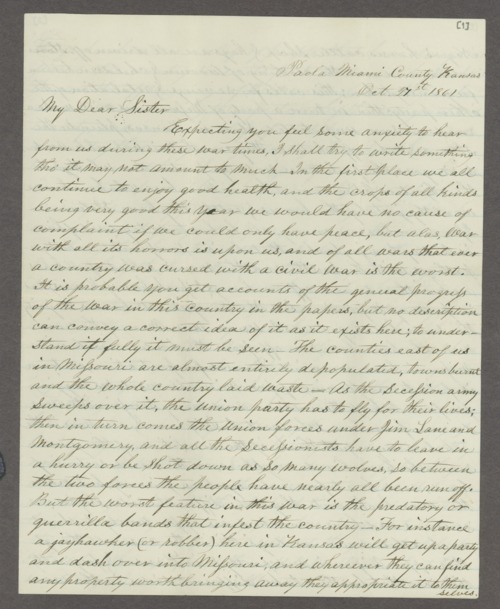 The letter from Allen to his sister concerns the numerous raids of the Jayhawkers and the Secessionists, and Lane leading a number of blacks to the area. The second letter from W.W. Phillips to John B. Ward focuses on the excitement that war has brought to the area, trouble with the Indians, and Kansans readying themselves for future skirmishes with Missouri. Collections - Manuscript - Ward, Allen T.